On the afternoon of June 24th, a strong supercell near Terre Haute, IN strengthened as it moved toward the northeast. As this occurred, the storm sprung a weak tornado along its path – which was later classified as an EF-1 on the enhanced Fujita scale, with wind speeds of close to 100 mph by Indiana officials. The tornado initially touched down near Perry Road in Plainfield at around 2:30 PM. From there, the twister continued along its northeast trajectory (see path below) before lifting about ten minutes later and passing through Hendricks County and several southwestern suburbs of Indianapolis. 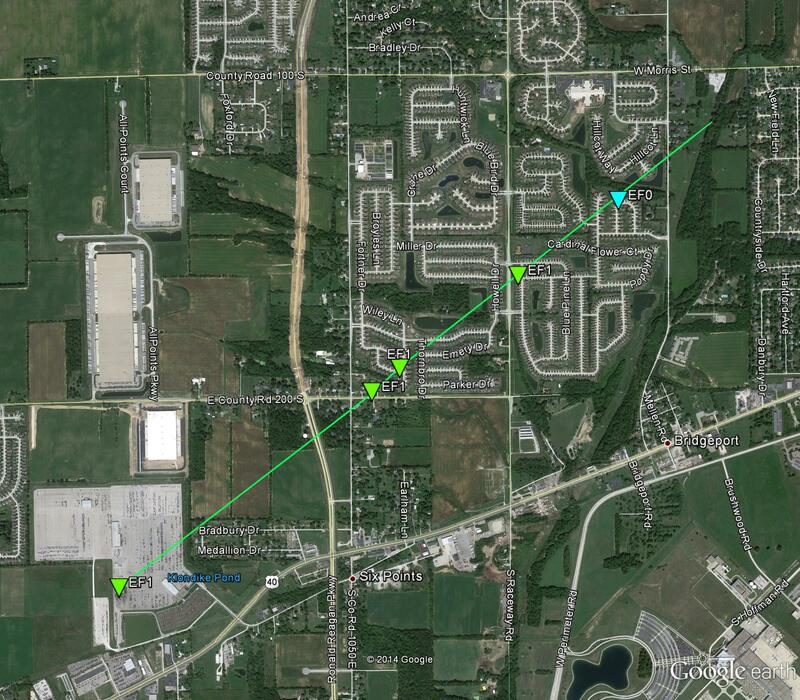 Path of the tornado from the Indianapolis NWS office. Although mostly minimal, it is estimated that about 75 to 100 homes in all were damaged from this storm. Most buildings that were impacted sustained roof damage, while others had siding taken off or windows knocked out. In one instance a recreational camper was blown onto the home (see below), which destroyed both the vehicle and caved in the majority of the roof. Thankfully, no injuries were reported with this event. Photo of tornado damage around Plainfield, IN. Image from the NWS office in Indianapolis. Indianapolis Power and Light Company also reported close to 2,000 service outages following the incident…although most of these were restored within 24 to 48 hours. Aside from the tornado, heavy rain was also associated with these thunderstorms and provided damage of their own. Torrential downpours prompted flash flood warnings to be issued across much of central Indiana after some individual cells dropped more than 2 to 4 inches of rain over the vicinity. About 40 miles southwest of Indianapolis, itself, a significant portion of Route 42 become flooded and was closed near Cloverdale, IN.